When Minted asked if I wanted to partner, I jumped at the opportunity. We've previously worked together on a gifts for Mother's Day and as I start to wedding plan, I've been spending a lot of time on the Minted website for inspiration. I know there are more important decisions to be made before stationary (like um, a date or venue) but it's probably not a huge stretch of your imagine to think about me perusing for pretty invitations first. Aaron and I moved into our current place just about a year ago. When we first moved in, I resisted the urge to impulsively buy home decor knowing that instead I should take my time finding pieces that really feel like "us". It's been little purchases here and there but I've really wanted to get some artwork up. 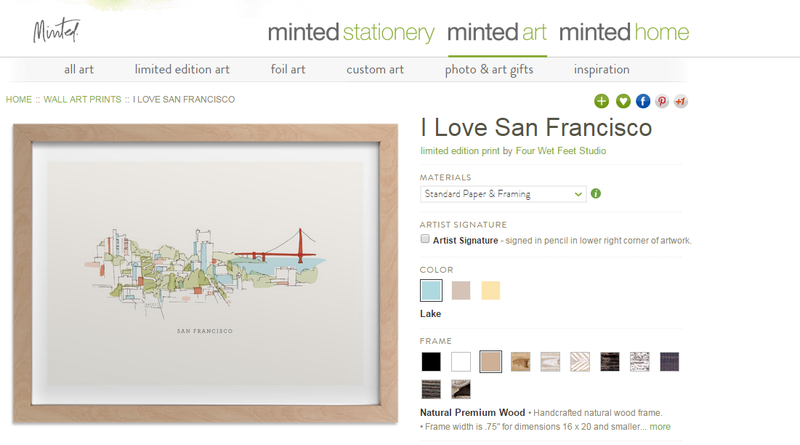 Enter: Minted Art. 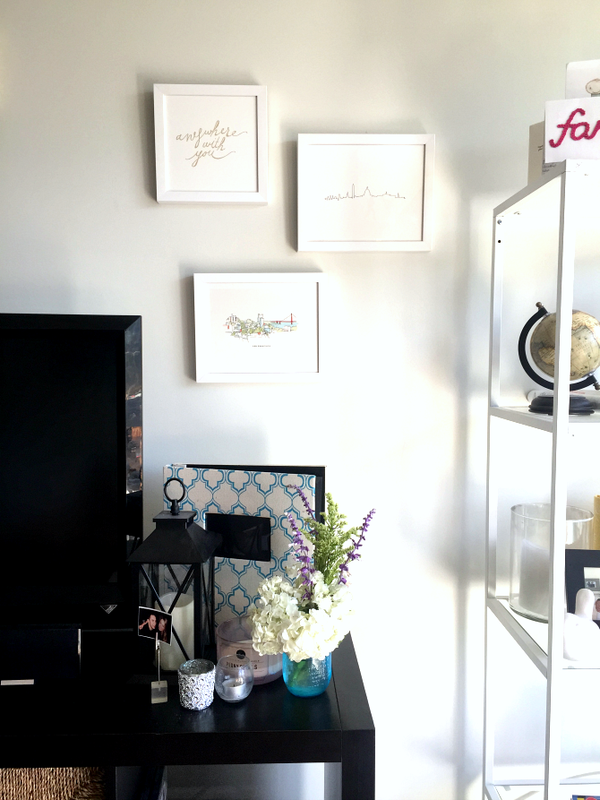 Minted couldn't make it easier to find art that speaks to you. With over 3,500 pieces to choose from, I promise you will find something perfect for that wall space missing a certain something. 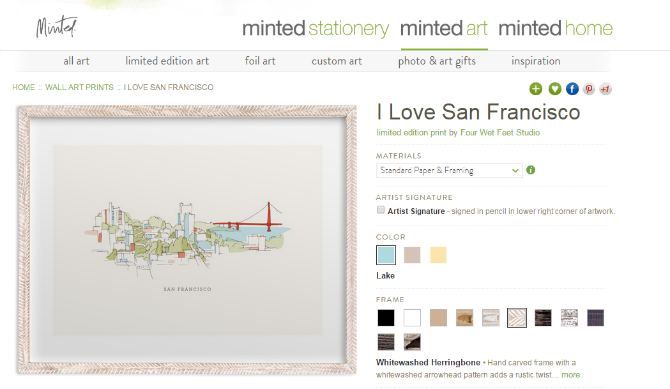 On top of the variety, Minted has an easy search feature (no surprise here but I immediately searched San Francisco) and gives you the ease of customizing each print. With choices in size, paper, color, and frame, each piece feels personal to you. With inexpensive and quick shipping, Minted is also perfect for any impulsive shoppers. I had some challenges narrowing down my choices but ended up going with three designs that felt personal to me and Aaron's life together. I chose simple white frames so that I can continue to add to this space with other white frames. There is an awkward white space between my bookshelf (DIY hack coming soon!) and our TV that always bothered me. It is not big enough for a big gallery but big enough to feel like a void. 10x8 frames were the perfect fit. The frames add a bit of personality and are so "us". Simple clean lines, pops of color, gold (well that's more me than Aaron) and prints that relate to our homes made these three designs perfect for our home together. FYI, Minted always has great coupon codes so if you're a first time Minted shopper or seasoned shopper, check these out. 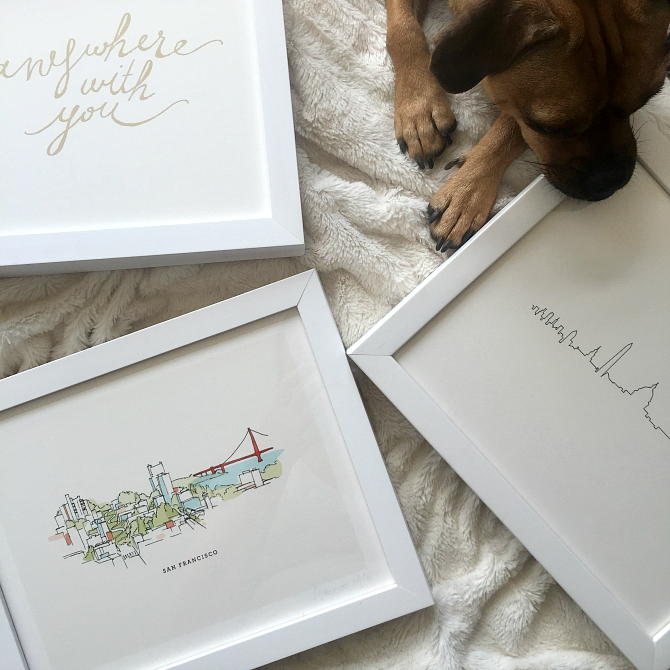 I recently had the opportunity to partner with Minted as well. Their selection of artwork is fantastic and the quality was more than I expected!